Project Seahorse by Pamela S. Turner, photographs by Scott Tuason. Grades 4-7. Houghton Mifflin Books for Children, August 2010. Review copy provided by publisher. 64 pages. Seahorses are cute little fish and so interesting! They're unique in that the male seahorses carry the developing babies and give birth to them. Seahorses mate for life! And yes, seahorses are threatened by human activity. Overfishing and unsustainable fishing practices (blast fishing that destroys coral reefs, for example) have caused the numbers of seahorses around the world to diminish. Project Seahorse is a team of scientists trying to figure out how to save coral reefs and seahorses without negatively affecting the people whose livelihoods depend on fishing the reefs. Amanda Vincent is a pioneer among marine biologists - the first person to study seahorses in the wild. When she discovered that numbers of seahorses were diminishing, she helped create Marine Protected Areas on islands in the Philippines in the hopes that they would allow fish populations to regenerate. Project Seahorse highlights the efforts of scientists and of local residents to protect coral reefs and create sustainable fishing practices. With stunning, clean ocean photographs, this is a nice entry to the Scientists in the Field series, but it's not one of my favorites. Young marine biologists will snap it up, but I would have liked a bit more focus. The text meanders from seahorses to coral reefs to fishing practices and the photographs included meander along as well. Yes, all these things are connected, but maybe a subtitle or an introduction would have cleared up my expectations for the book. I just wanted more information and pictures of seahorses! Check out Amanda's review at A Patchwork of Books! 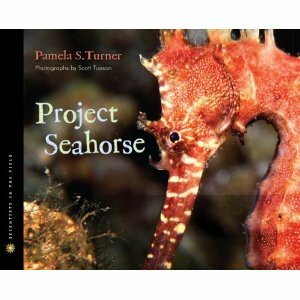 Project Seahorse will be on shelves August 23. And it's Nonfiction Monday! Check out this week's roundup at In Need of Chocolate.